It has been three (or four?) 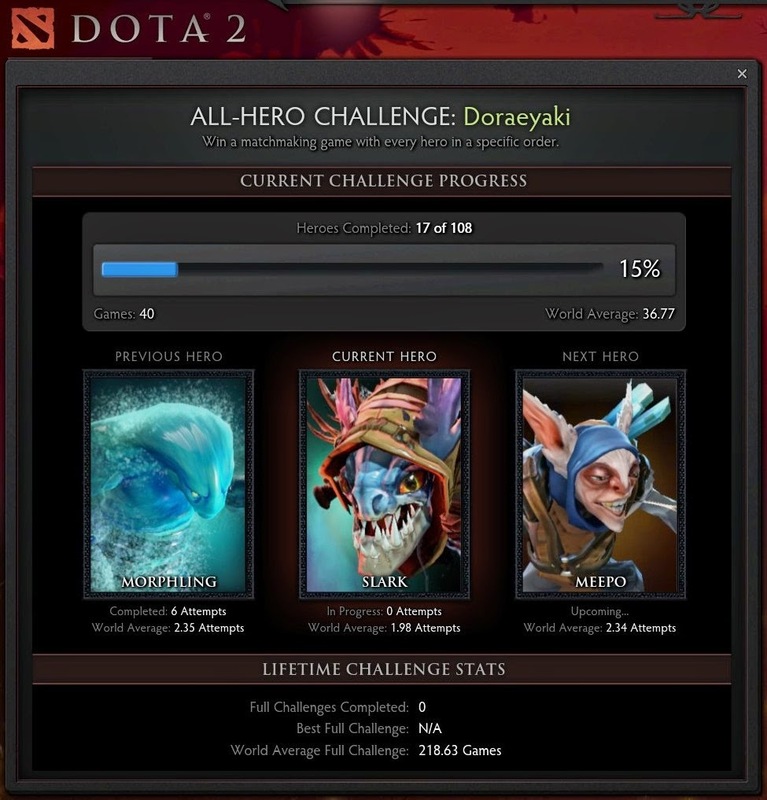 days since the almighty god Valve unveiled his challenge to the normal denizens of Steam, the Dota All Hero Challenge. The challenge where one is required to don on the mantle of all the legendary heroes in Dota 2, and win one game each for all the 108 heroes. One hundred and eight. I have been fighting ever since then, picking the heroes that appear on the list one by one, trying to score a win with each of them. It has been 40 matches with 17 heroes since then, with 91 more heroes to go. It's a long and torturous journey, and going by what that has been happening in the past 40matches, it seemed that the odds was never in my favor. Or in other words, it's freakingly unbelievably difficult. I'm not sure if I am that noob with some heroes (but it's not that I feed also) or that Steam seriously has some matchmaking issues, but for my first try with Broodmother, I spent a total of 8 games on it. Morphling came close at second with 6 games. Yes I had a 6 games and 8 games losing streak. Still I managed to clear some pretty tough heroes like Chen and Morphling (heroes that I can never master), so I guess that's not too bad. My only worry now is how horribly I'll die when it comes to heroes like Meepo. Or Techies.